With the recent critical releases of La La Land, Denzel Washington’s adaptation of August Wilson’s Fences, and Hidden Figures, audiences are witnessing the beauty of film at the cinema. Add in Kodak’s new Super 8 Camera (image below) and the return of Ektachrome 100 film stock (both to be released later this year), many young people are gaining interest in celluloid acquisition. 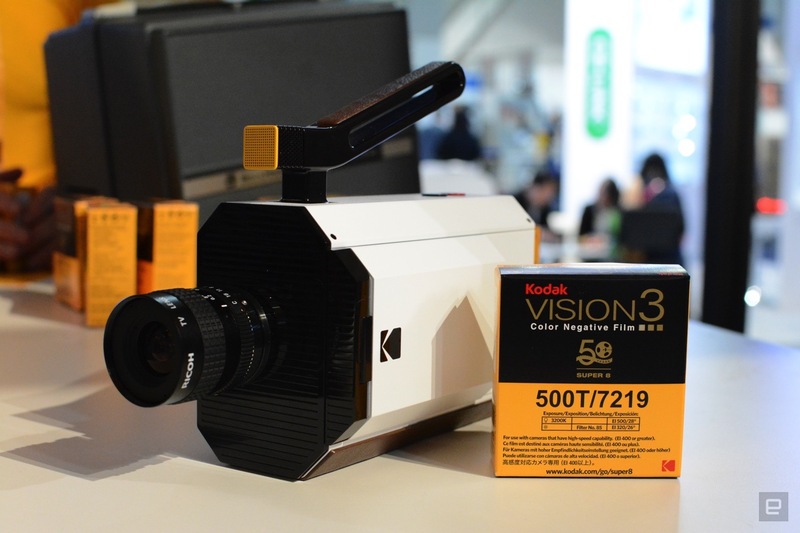 The new Super 8 camera reaffirms Kodak’s commitment to making motion picture film stock and for innovating within the field. These critically acclaimed film releases combined with Kodak’s exciting announcements are encouraging movie makers across the globe to shoot film. There is truly an analog renaissance happening. The positive news is fostering in interest in the art of the moving image – an art that has thrived for 120 years. The properties of celluloid and a traditional film education continue to build an acute awareness of the potential of the medium of film as a creative tool. Many know of the values of film acquisition – crew discipline, unlimited color, large exposure latitude, and proven archival properties. However, what many people do not know, is the value of a traditional film post- production workflow. The intention of this article is to explore some of the merits of traditional film splicing and share some of the reasons for working in this tradition. For those who are interested in journeying into the magical landscape of celluloid post production, please read on. Hopefully you will find the inspiration and courage to cut your first true motion picture on film. We are just the beginning of the analog renaissance, and although we have seen mainstream movie makers in greater numbers capture on film, many are finishing in the digital realm. The hybrid process of shooting film, scanning, and editing digitally works well, but the film does lose some soul in the process. When celluloid film is projected, the image seen on the screen is made by the light shining through the material, not a representation in digital 1s and 0s. This factor is what makes working with the material of film unique. This leaves room for filmmakers and labs to develop a modern workflow for traditional film editing and finishing. Every artist will have his/her own reasons for engaging with a particular medium. With video someone may prefer the ability to edit and revise and add effects and with film they may prefer the tangible and malleable qualities of the physical material. In 2011, British film artist Tacita Dean made a piece titled, Film, for the Turbine Hall at the Tate Modern Museum. The 11 minute 35mm film celebrated the analogue process, and gallery patrons were able to see what a pure film – shot, edited, and finished on film looks like. Dean turned the film on its side, displayed the perforations, and manipulated the image through mattes. Her work was truly a portrait of the medium of film. Steven Spielberg and Academy Award Winning Editor Michael Kahn mark a cut with a grease pencil. In order to truly understand the innate difference between the mediums of film and video, one should venture down the path of completing a short film entirely in the photo-chemical process. Keep a journal by your side and jot down the discoveries as you go, as you will not only learn about film editing, but it will teach you the values of video editing as well. It is only through experience that we can articulate defining characteristics of each medium. Film editing brings many changes to process in the way of thought and creativity. I feel the same passion for working with film as Tacita Dean. This enthusiasm for a pure film led me to complete my own adventure series, Navigators of the Shadow Ring, entirely through analogue means. From typewriter to splicer, I challenged myself and my creativity to work within the medium of celluloid. During the making of the first chapter of my 16mm adventure film, I made several discoveries in the 16mm workflow. Many of these discoveries came from the editing of the film on an Upright Moviola and cutting on a traditional film bench. Were there frustrations? Yes, a few, such as trying to transfer sync sound using a Siemens 2000 projector that had a wild variable speed motor. I did spend hours trying to make this basic projection tool work against its purpose, but even that long engagement taught me how to transfer and cut sound on my own without a lab. There’s always something to learn if you are open to listening during the process. Overall, I felt a sense of freedom, freedom from distractions and from the computer. This is an image of the author’s editing room with an Upright 16mm Moviola pictured left of the work bench. Rushes(dailies)- From watching the rushes with your crew to hanging the trims, having the physical film in your hands puts the team directly in touch with the images made on location. It is a joy to sit with the cast and crew and watch the 16mm dailies in full color flickering on a homemade screen in your living room. The film becomes more intimate and you have a deeper knowledge of what images you have captured and how best to use them. There is a tendency with video editing to just dive into the footage, skip logging, and take short cuts. The process of logging film gives time to learn about your footage and find the gems in the footage. Relevance – The Upright Moviola machine, tape splicer, and rewinds will not text you, email you, or tempt you to look up some bit of irrelevant information. The single purpose of the film editing tools keep your eyes on the film and thinking about the story and the concepts. When one runs into a mind block when editing on a computer, you can simply escape the process by searching for some random information or by completing an email task. Film forces you to stay with the problem and solve it. Reverie – The traditional editing process encourages note taking and pre-visualizing before each cut. One is constantly making connections while sitting at the editing table or at other places where reverie takes place, such as the shower. There is a lot of forethought going on before you place down a piece of tape. When I cut on video, I work rapidly and in a primal way – just responding to the movement and image changes. A lot of images are joined without stopping to think. Sure, I can step away from the computer for a few days so I can reevaluate, but with film it seems I am reassessing at each cut. Control – The images are right in front of you. You can see a long strip of film with many frames on it at once. This gives you a strong sense of the frame and where to make the cut. One physically moves the the film through a film viewer or pushes down on the pedal to drive it forwards and backwards through the Moviola. The speed adjusts easily by your body motion. When you stop or put on the breaks, the film stops right there for you to examine it. There is no need to worry about hard drive crashes, incompatible formats, or a random glitch in the software. You just feel in control as you orchestrate the motion of images. Resolution – Working with film in a video editing system opens up a number of possibilities which includes cropping, coloring, and adding in effects, but what it lacks is native physical quality. Working with film instead of a file of the film, one works with the full image resolution (no compression) and infinite color every time. When the 16mm image is projected on a screen, it is how the audience will see it. I can project the film on any screen size or wall and my image quality stays the same. Rewards- Creating a reel of film is rewarding. One can see the length of the film building up – longer and longer as you edit on. There’s a sense of accomplishment and satisfaction to feeling the length of the movie run through your finger tips. 1970s image of Thelma Schoonmaker working on a KEM 35mm flatbed editor. My students and I am certainly not the first people to distinguish the very real difference between the film and digital video workflows. In fact many Hollywood filmmakers and artists have spoken up recently. Tacita Dean, Christopher Nolan, Quentin Tarantino, Steven Spielberg, and J.J. Abrams are just some of the voices championing the film medium and encouraging others to maintain the choice of image capture. Long-time Steven Spielberg collaborator Michael Kahn cut all of Spielberg’s films on the Upright Moviola from Close Encounters of the Third Kind (1977) to Indiana Jones and Kingdom of the Crystal Skull(2008). Spielberg said in a 2011 article in the Guardian ” My favorite and preferred step between imagination and image is a strip of photochemistry that can be held, twisted, folded, looked at with the naked eye, or projected on to a surface for others to see.” The students and Steven Spielberg’s thoughts line up on how the imagination and the physical come together in the act of working on film. Others are on to this fact too. Tacita Dean handles film from start to finish and Nolan continues to cut work-prints while Tarantino championed the return of Ultra Panavision 70mm projection for The Hateful Eight and owns the New Beverly Cinema. The New Beverly is dedicated to showing films on 35mm prints. Dean, Tarantino, and Nolan have been outspoken and continue to show the world through their work why the choice of film is important to movie makers and audiences and why the projected film print has a place at the cinemas. We live a world where we have so many ways to make an image, and that is a good thing. Why would we reduce our tools to just one instead of expanding them to many. Maintaining film and the celluloid choice guarantees diversity in art and foster’s creative innovation. The choice extends into post-production and exhibition, too. The ideal situation would be for cinemas to be outfitted with projectors to screen in the way the film or video maker desires – whether it would be 35mm, 70mm, or 4K digital video. Think of the cinema becoming more like an art gallery, where the artist works with the gallery to set up an installation. Film and video makers can support one another. A great example of this support can be found in a 2013 article from the Guardian. The article covers director Ken Loach’s plea for hard to find edge numbering tape to finish his film Jimmy’s Hall. This tape is used to code number traditional film for syncing. Loach and his team could not find any tape in the UK and after running an add in Screen magazine, their request was answered by none other than the editors at Pixar! The fight for film is not about endorsing a technology, it’s about building community and making visionary work that lasts. 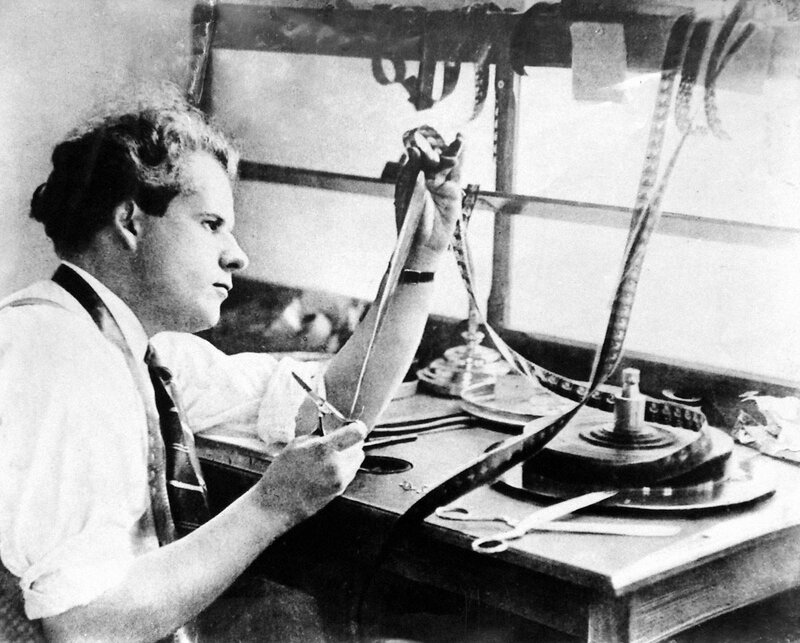 Russian filmmaker and theorist Sergei Eisenstein examines a shot at his editing bench. There has been an analog renaissance countering the “digital revolution” and it can be seen at the cinemas in small films such as I, Daniel Blake (2016) and Loving (2016) through larger Hollywood productions such as Hidden Figures (2016), and the newest Christopher Nolan epic Dunkirk (2017). This is only a few of the many notable productions from around the world creatively utilizing film. Students and young filmmakers are looking for something fresh, exciting, and deeply rewarding. Making a movie on film satisfies all three of these requirements. It is not about cheaper and faster, it is all about ideas and quality. Quality not just meaning image quality, but quality time in the editing room – thinking time. My privilege of introducing 16 SUNY Oswego Cinema students to traditional splicing was deeply rewarding. The two assignments made Eisenstein’s 5 types of montage and D.W. Griffith’s continuity editing techniques come alive. Together we toured through the art of motion pictures, and the students were able to walk in the footsteps of legendary filmmakers and editors. After the montage project one student remarked that she felt like an artist while she cut and spliced film. I responded back to her, “that’s wonderful because you are an artist” and “making movies” is an art. Yes, she said, but this revelation had not happened while she edited video in a software on past projects. The other 16 students agreed that there is something special about moving around, driving the film through a viewer, and using your hands to join the images. The film needs you and you need the film. In this way, the editor develops a relationship with the material by making the picture union. The relationship in turn gives birth to new ideas, whether they be in the style of Dziga Vertov’s “Kino Eye” or Sergei Eisenstein’s “Kino Fist.” This is the power of cinema, so let’s keep it alive and share the knowledge of traditional film editing. Go ahead, grab a splicer and some tape and become a filmmaker! Ehrlich, David. “Legendary Editor Thelma Schoonmaker Reveals the Process of Cutting ‘The Wolf of Wall Street’.” MTV News. MTV News, 23 Dec. 2013. Web. 29 Jan. 2017. Forever, BFI Film. “Christopher Nolan and Tacita Dean to Headline ‘LFF Connects’.” British Film Institute. BFI, 28 Aug. 2015. Web. 29 Jan. 2017. Hernandez, Eugene. “Notebook: The Future of Film.” Film Comment. Film Comment, 12 Mar. 2015. Web. 29 Jan. 2017. Hess, John P. “Watch: The Soviet Theory of Montage & the Five Editing Methods.”Watch: The Soviet Theory of Montage & the Five Editing Methods. Filmmaker IQ, 20 Apr. 2016. Web. 29 Jan. 2017. Higgins, Charlotte. “Tacita Dean’s Turbine Hall Film Pays Homage to a Dying Medium.” The Guardian. Guardian News and Media, 10 Oct. 2011. Web. 29 Jan. 2017.
http://www.indiewire.com/author/erichkohn/. 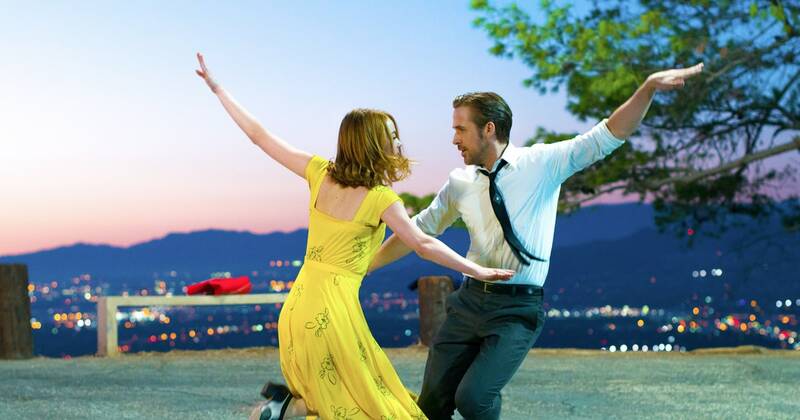 “‘La La Land’ Review: A Lively Supercut of Classic Musicals Starring Ryan Gosling and Emma Stone.” IndieWire. IndieWire, 30 Aug. 2016. Web. 29 Jan. 2017. Pulver, Andrew. “Ken Loach’s Plea for Hard-to-find Editing Equipment Answered by Pixar.”The Guardian. Guardian News and Media, 29 Oct. 2013. Web. 29 Jan. 2017. Shapiro, Ari. “Kodak To Revive Storied Super 8 Camera.” NPR. NPR, 15 Feb. 2016. Web. 29 Jan. 2017. Scorsese, Martin. 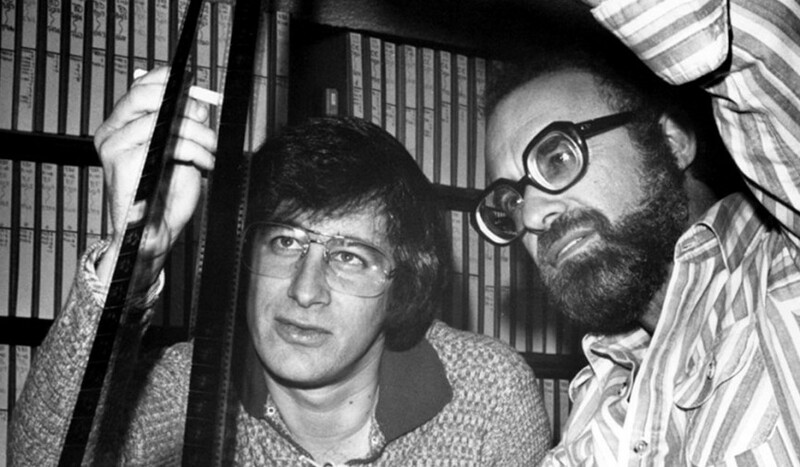 “Steven Spielberg & Martin Scorsese: The Joy of Celluloid.” The Guardian. Guardian News and Media, 10 Oct. 2011. Web. 29 Jan. 2017. Silva, Bianca. “Kodak Brings Ektachrome Back to Life.” Time. Time, 5 Jan. 2017. Web. 29 Jan. 2017. Ulaby, Neda. “As Film Stocks Dwindle, Movie-Makers Weigh What May Soon Be Lost.”NPR. NPR, 8 Aug. 2014. Web. 29 Jan. 2017. Wire, http://www.indiewire.com/author/cfg/ Indie. “How Quentin Tarantino Resurrected Ultra Panavision 70 for ‘The Hateful Eight’.” IndieWire. IndieWire, 23 June 2016. Web. 29 Jan. 2017. This entry was posted in Film, film studies, Filmmaking, James River Film Society, Uncategorized and tagged 16mm, 16mm Editing, Christopher Nolan, Cinema and Screen Studies, D.W. Griffith, Daniel Blake, Dunkirk, Dziga Vertov, Film, Film Splicer, Getty Museum, Guardian, Hidden Figures, I, IMAX 70mm, Jacob Dodd, Jimmy's Hall, Ken Loach, Kino Eye, Kodak Motion Picture Film, La La Land, Loving, Michael Kahn, Montage, Moviola, Panavision 70mm, Pixar, Quentin Tarantino, Sergei Eisenstein, Splicing, Steven Spielberg, SUNY Oswego, Super 8mm Camera, Tacita Dean, Tate Modern Museum, The Hateful Eight, Thelma Schoonmaker. Bookmark the permalink.